Inside this issue: implanting evolution, open source biotech consumables, power supplies for systems biology, and more. 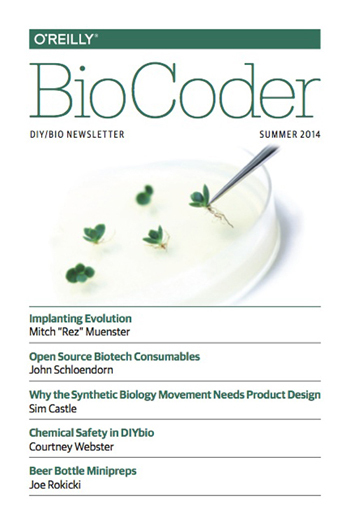 The Summer 2014 edition of BioCoder is now available for free download. We’ve made it to our fourth issue of BioCoder! I’m excited about this issue — it’s the best collection of articles we’ve published so far. We spend a lot of time thinking about how to modify other creatures, from microbes on up. What about ourselves? Surgeons already implant pacemakers and insulin pumps into humans. What about other applications? What are the possibilities if you implant NFC and RFID chips? One of the biggest problems for grassroots biotech research is the price of ingredients. Some proteins cost thousands of dollars per milligram, hardly affordable by a community lab or a small startup. We can solve that problem with “open source” DNA. This is an exciting development — and a challenge to what we mean by “open source” (I promise to write about that in another post). Biology is messy. There are a lot of chemicals, and those chemicals need to be handled safely. Courtney Webster gives you the basics for safe chemical handling. Equip your lab! Build a power supply for electrophoresis and other applications. The total cost should be less than $100; the commercial supplies are frequently more than $5000. More practical labwork: tools for replicating DNA. There’s plenty more — download your free copy of BioCoder issue 4 to get it!